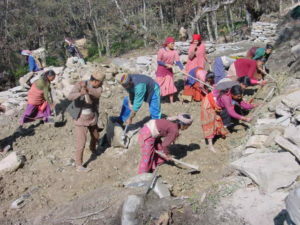 Skat, in association with 2 Nepalese consulting joint venture partners, has been selected by the Government of Nepal to provide consulting services and to assist the Government agencies responsible in the implementation of the ADB, DFID, SDC, OFID -funded Rural Reconstruction and Rehabilitation Sector Development Programme. The objective is to provide efficient and effective managerial and technical support to the project for the enhancement of the stakeholders involved in the process. Whilst Skat has the overall management and the team leader position, the joint venture partners provide the professional local staff and administrative support. Reconstructing and rehabilitating rural infrastructure so that in the coming years, substantial peace and development dividends can be gained by the rural economy of NepalThe development objectives of the program are to improve physical connectivity; to enhance livelihoods including economic and employment opportunities and to increase access to market and social services for rural communities. It is designed to reduce poverty in hill, mountain and terai districts where isolation and hardship are common. The project is being implemented in 20 core districts not covered by other major donor-funded rural infrastructure development programs.